Volunteers at the 15NTC in Austin, Texas. 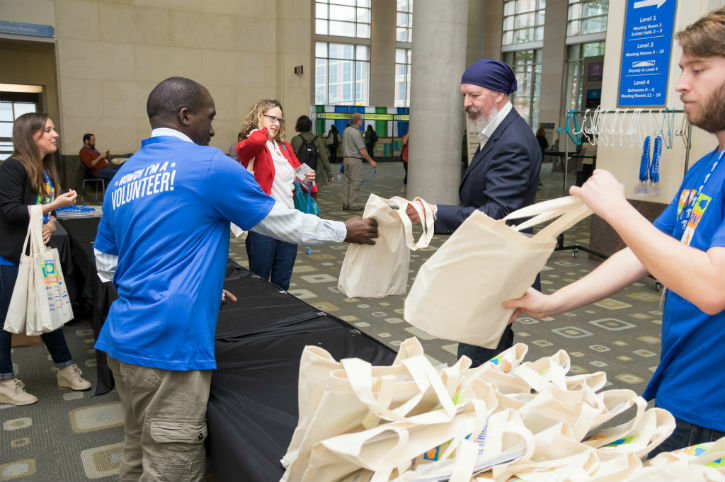 It takes a lot of work to put on a conference for a few thousand nonprofit professionals—luckily, we have some dedicated volunteers who help us make it happen. Besides saving you a chunk of change on registration, volunteering at the Nonprofit Technology Conference is a great way to meet people. You get to help attendees, meet presenters, and build your connections. And this year, we’ll have room monitors, which means you may be able to sit in on some sessions while volunteering—double win! You’ll also get some exclusive volunteer swag, and lots of appreciation from everyone at the conference. We talked to three previous NTC volunteers about their experience—here’s what they had to say. What did you most enjoy about volunteering at the NTC? Megan Bruce: I really loved meeting other volunteers and conference-goers. The NTC is such a vibrant and welcoming community, and it’s fun to really feel like you’re a part of it and to be able to give back as a volunteer. I also met two other volunteers who are based in my newly adopted hometown of Seattle, which was great! Mark Mathyer: Volunteering at the NTC allows me to support an event that has been very useful and enjoyable to me for many years. Taida Horozovic: Being one of the first people to welcome people to the conference and help them register quickly (or find the information they need) felt really good. I loved connecting with people and learning more about topics that I am curious and passionate about. Any particularly memorable experiences to share? Mark: I remember most the happy faces and grateful responses of the attendees that I assisted. At the 17NTC, I was a room guide at the top of the stairs, and a lunch table guide. Some people made me feel like the simple act of telling them where to go made their whole world a brighter place. Megan: At the end of one of my volunteer shifts, I sat down on a chair next to someone I had helped direct to a session earlier. We ended up bonding over the fact that she lived in Brooklyn, where I had just moved from, and that we both had worked at social justice nonprofits. I ended up introducing her to another friend in Brooklyn who had just moved to town and also works in that space, and they’re now friends and talk regularly! It was just a really cool connection to make. Taida: I just remember that it felt like walking into a place where I belong, and my curiosity grew the whole time I was there. There are so many opportunities to do fun activities and to meet seriously smart and awesome people. What’s your #1 tip for future NTC volunteers? Megan: Take advantage of your enhanced visibility and talk to as many people as possible. One of the best parts of NTC is meeting people who really understand the nature of the work you do and who share a lot of the same values as you. 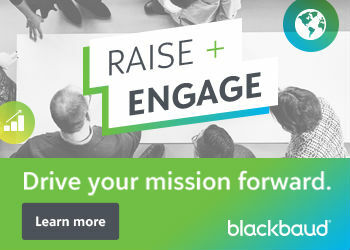 It’s such a great place to meet like-minded and passionate people and to share tips and tricks about improving the nonprofit sector through technology. Taida: Come early and with an open heart and mind. What’s the most important thing you learned as a volunteer? Taida: All the volunteers working together as a team (and we were an awesome team ) play an important role in the conference running smoothly and keeping everything on a positive note. It was kind of an honor to be a part of that. Megan: People are sometimes shy about asking for help, so as a volunteer, it’s good to be proactive. For example, the Washington DC venue last year is basically a labyrinth: I saw a lot of people wandering around looking lost and sort of looking in my direction, but seemingly were a little nervous about asking for help. By proactively identifying people who looked lost and offering to help them, I made it a lot easier for those people to find their sessions in time, and staying busy helped make the volunteer shift go by really quickly. Mark: It takes a lot of energetic people to make a great event happen. How did volunteering help your personal or professional goals? Taida: I gained a lot of confidence. In a way, I affirmed without seeking it that I am doing well in terms of using technology, but more importantly I found awesome ways to improve my work and learn more after the conference thanks to the amazing collaborative notes and shared resources. Megan: I always like to challenge myself and, being a bit of an introvert, I find it sometimes intimidating to be in a position where I have to talk to a lot of people. So it was great to get the opportunity to interact with lots of people as an NTC volunteer. It was also a lot of fun, and helpful: everyone is super-friendly and nice, and volunteering helps you feel more comfortable during the conference, because you’ll see people you recognize in every session. If you’re hoping to come out of NTC with new connections and friends, being a volunteer is the best way to achieve that. Mark: Volunteering gives me a chance to see, and re-connect with, friends and colleagues from previous NTCs. Apply to be a volunteer at the 18NTC! Leana is passionate about embracing technology to achieve transformative social change. She believes that solutions to some of the world’s biggest challenges can be found in grassroots communities from Chile to Kenya, and that technology is the megaphone for their voice and agency. Leana's background is in international development and cooperation, primarily how communities can use technology to make change, both locally and globally. A native of Ukraine, she speaks Russian, English, Spanish, and um pouquinho de português and holds a BA in Spanish and Latin American Studies from Pitzer College, as well as an MA in International Studies from the University of Chile. Outside of office hours, you’re most likely to find Leana hiking with Atlas, her one year old rescue mutt.